This week we’re exploring some communications trends that I think are affecting your communications efforts at your church . . . whether you acknowledge them or not! It’s not that people can’t read . . . they just don’t. 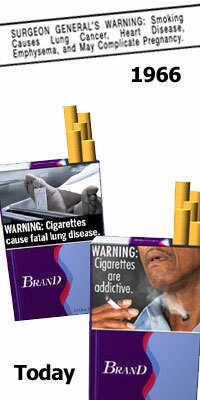 Did you see the changes to the “warning labels” on cigarette packages that are coming down? Our culture continues to march towards being totally post-literate. More people in your church relate to ideas, concepts, and data through images and visual stimulation than in any other point in recent human history. If you think this isn’t affecting your people . . . think again! The surgeon general’s office knows this is happening and is making sweeping changes to the way they get the message about about anti-smoking . . . you need to change the way you communicate as well! What difference does this make to way we communicate to our churches and communities? Show don’t tell // A picture has always been worth a thousand words . . . now a good picture or object lesson is worth 10 minutes of words in your message. Your environment matters // The way things look at your location are communicating to visual learners. Messy and unorganized? People are judging this like never before! Preacher + Graphic Designer // It used to be a good graphic designer was a “nice to have” on your staff team . . . now you need to find a way to work hand in hand with someone native to the visual culture. People of the Book? // This isn’t a philosophic blog . . . I try to focus on delivery and execution in the local church . . . not theories and ideas. However, there are huge ramifications for our faith if we continue to focus on the written text. The Christian faith shifted toward the text in the enlightenment era with wide levels of literacy. We’re going to have to learn from pre-literate cultures around the world and look into our past to understand how to disciple people in this new world. I think you are right on with these observations. I really like how you used the new smoking ads as a proof to your point. I even saw that since the ads they have already seen a huge spike in calls about the dangers of smoking and the ads haven’t even be put on the boxes yet! You are so right that less is more. The more information you give people, the more cluttered it becomes in their minds. That’s why I love “One point sermons” that involve illustrations and application more than just dishing out information. A great book on that is, “Communicating for a Change” by Andy Stanley. Older book now, but get ideas on communication and sermon prep. Why drips are more effective than explosions in church communications.